This B&H Kit of six Xeen Cinema Lenses includes the 14, 24, 35, 50, 85, and 135mm lenses. This provides you with a full, color-matched set of lenses that cover full frame and are fitted with PL mounts. The lenses feature an internal focus design, which means that the front of the lens doesn't rotate as you change focus, and the lens maintains a constant volume. Dual-sided focus marks make it easier on your camera assistant working on either side of the camera, and the 200° of focus barrel rotation provides ample real estate for precision marking. Each lens incorporates built-in, cinema-style focus and iris gears that share common positions, making for fast lens changes. The 24, 35, 50, and 85mm lenses feature a maximum aperture of T1.5 and an 11-bladed iris. The 14mm features a maximum aperture of T3.1 and has a 9-bladed iris, while the 135mm is still fast at T2.2 and incorporates an 11-bladed iris. As these are cinema lenses, the iris is designed to be clickless, allowing smooth aperture pulls. Rokinon's Xeen 14mm T3.1 Lens for PL Mount is built specifically for use as a cinema lens. It features an internal focus design so that the lens does not change size while focusing, minimizing the appearance of breathing when changing focus. Each lens in the set is multi-coated for good contrast, glare prevention, and color-match to a factory standard, allowing you to assemble a set over time with minimal color shift. This 14mm lens provides what is considered a very wide angle of view on full-frame cameras, and a tighter angle of view on smaller formats. Rokinon's Xeen 24mm T1.5 Lens for PL Mount is built specifically for use as a cinema lens. It features an internal focus design so that the lens does not change size while focusing, this minimizes the appearance of breathing when changing focus. Each lens in the set is multi-coated for good contrast, glare prevention, and are color matched to a factory standard, allowing you to assemble a set over time with minimal color shift. This 24mm lens provides what is considered a wide angle of view on full-frame cameras, and a tighter angle of view on smaller formats. This is a 24mm lens that has an image circle that covers a full-frame sensor. When mounted on a camera with a Super 35mm sensor it provides you with a tighter shot than if it was mounted on a camera with a full-frame sensor. Rokinon's Xeen 35mm T1.5 Lens for PL Mount is built specifically for use as a cinema lens. It features an internal focus design so that the lens does not change size while focusing, minimizing the appearance of breathing when changing focus. Each lens in the set is multi-coated for good contrast, glare prevention, and color match to a factory standard, allowing you to assemble a set over time with minimal color shift. This 35mm lens provides what is considered a somewhat wide angle of view on full-frame cameras, and a tighter angle of view on smaller formats. Rokinon's Xeen 85mm T1.5 Lens for PL Mount is built specifically for use as a cinema lens, and is not a modified still photo lens. It features an internal focus design so that the lens does not change size while focusing, minimizing breathing. Each lens in the Rokinon Xeen cinema lens set is multi-coated for good contrast, glare prevention, and color matched to a factory standard, allowing you to assemble a set over time with minimal color shift. This 85mm focal length is often chosen for portraits and close-ups. The lens features dual-sided focus scales in feet, with dual-sided iris scales. The 11-bladed iris provides a rounded aperture for a natural looking highlights and Bokeh. This is an 85mm lens that has an image circle that covers a full-frame sensor. It has the effect of bringing the background closer, and is often used for portraits and close-ups. When used on a camera with a Super 35mm sensor as opposed to a full-frame sensor the lens becomes more suited for tight close-ups. A minimum focusing distance of 3' 9" allows you to get up close to your subject. Rokinon's Xeen 135mm T2.2 Lens with PL Mount is built specifically for use as a cinema lens. It features an internal focus design so that the lens does not change size while focusing, minimizing breathing. Each lens in the Rokinon Xeen cinema lens set is multi-coated for good contrast, glare prevention, and color matched to a factory standard, allowing you to assemble a set over time with minimal color shift. This 135mm focal length is often chosen for portraits and close-ups. The lens features dual-sided focus scales in feet, with dual-sided iris scales. The 11-bladed iris provides a round aperture for natural looking highlights and Bokeh. 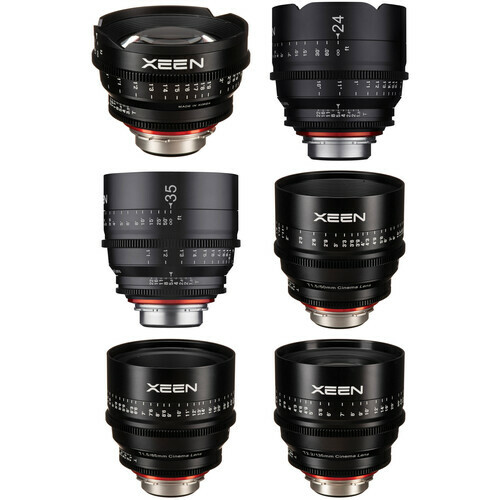 Each lens in the Xeen series share common focus and iris gear ring positions, which speeds up lens changes as accessories such as follow focus units or iris motors don't have to be re-positioned. The lenses in the Xeen series also share focus and iris rotation, with focus having 200° of rotation and iris having 40° of rotation. The common 114mm front diameter between lenses in the series allows for quick lens changes as you don't have to swap out anti-reflection donuts or adapters to use the same matte box. A minimum focusing distance of 2.6' allows you to get up close to your subject. Box Dimensions (LxWxH) 9.0 x 7.1 x 6.85"
Box Dimensions (LxWxH) 9.0 x 6.95 x 6.95"
Box Dimensions (LxWxH) 10.3 x 7.8 x 7.8"
Box Dimensions (LxWxH) 9.0 x 7.0 x 6.9"
Xeen 14, 24, 35, 50, 85, 135mm Cine 6 Lens Bundle (PL) is rated 5.0 out of 5 by 1. Rated 5 out of 5 by Sebastian from Impressive!! With these lenses you truly get more bang for the buck! They have a very rugged build quality, smooth lens rings and the image quality is really really decent. If you compare these to Summicron lenses they will of course show some flaws, but will also hold up surprisingly well! I would say all the well known high end lenses might be more than ten times as expensive, but definitely not ten times better... In fact, the differences are noticable, but rather marginal.